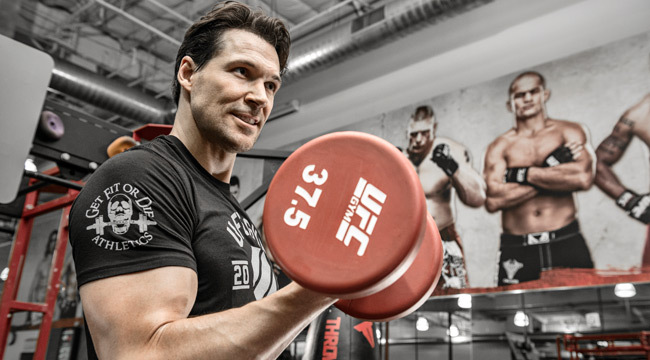 'X-Men: Days of Future Past' star Daniel Cudmore used his imposing physique to go from British Columbia to the bright lights of Hollywood. The true mythology of Marvel’s Colossus belies the bullet-deflecting, building-smashing heroics that diehard comic fans love him for. Born on a farm near Siberia, Russia, Piotr “Peter” Nikolaievitch Rasputin is a peaceful, humble country kid who just happens to possess a tall, muscular frame. The man who has portrayed him in three X-Men films, Daniel Cudmore, has a similar origin story. Born and raised in the quaint municipality of Squamish, British Columbia, Cudmore’s laid­back persona and small­ town manners stand in stark contrast to his towering height (6'8") and rough-­and­-tumble athletic proclivities. A multi­-sport star, he received several offers to play soccer, basketball, and football at the college level, eventually settling on the gridiron of Gannon University in Erie, PA. There, he made his mark, violently plowing through defenders as a tight end. So it was only fitting that in 2003, after seven callbacks, he was cast to play the storied but soft­spoken metallic hero Colossus in X2: X-Men United. The comic fans will tell you that Colossus only uses his strength when it’s absolutely necessary. It’s here where we find the largest divide between the hero mutant and the man charged with bringing him to life on the big screen. Cudmore likes to use his strength all the time. On everything. Without ceasing. Daniel is the middle of three brothers, all card-­carrying members of the 6'5" ­and­ over club. “We have an ectomorph, an endomorph, and a mesomorph,” he says of the brothers Cudmore, Daniel being the muscular mesomorph of the bunch. His older brother, Jamie, is a broad-shouldered beast that makes his living playing professional rugby; his longer, leaner, younger brother, Luke, has also played rugby at the national level for Canada. If you’re in the same room with them, just hope no one throws you a ball. For Cudmore, football was his ticket out of Vancouver and, perhaps, his ticket into Hollywood. Once he got settled as a collegiate athlete, he was able to fully realize his physical potential. Though he was already a dedicated lifter, he now had the privilege of working under the watchful eye of strength coaches, and his physique responded in kind. Cudmore welcomed intensity and enjoyed pushing his body to its limits—traits he has never abandoned. But eventually, his body began to push back. Troubled disks and beat-up knees can be par for the course for hard­training athletes. But a broken ankle in his first year at Gannon—on which he continued to play after an initial misdiagnosis—spelled the end of his career as a competitive athlete and prompted a move back to British Columbia. This break, as it turned out, may have led to another—in film. And while his ability to navigate a script came in handy, it was ultimately his physical presence that led director Bryan Singer to cast him as Colossus. Twilight series, The Baytown Outlaws, and the live­action Web series Halo 4: Forward Unto Dawn, all of which carried heavy physical demands. And while Cudmore, like every actor, hopes to explore characters with more depth and heavy­handed dialogue, you won’t hear any complaints out of this gym rat whose Twitter page boasts: I’m just a tall man trying to make it in a short man’s world. Actor, adrenaline junkie, sports and car fanatic, lover of life! When your characters carry handles like “Colossus” and “Master Chief,” you’ve got to project pure alpha male swagger, and for Cudmore, that starts in the gym. Since he was tapped to play the sinister Felix in the Twilight saga in 2009, he’s been working with CrossFit competitor-­turned­-performance coach Garth Prouse, a former rugby player and the owner of Northwestern Athletics in North Vancouver, BC. Cudmore gains mass easily, Prouse says, so care must be taken to ensure that they’re following protocols that elicit a particular kind of look. “For Twilight, he wanted to be leaner but not skinny—just a bit more ripped up. When he signed on for this latest X-Men film, his goals were similar: He wanted to stay lean but put on a little more size in the chest, shoulders, and arms. 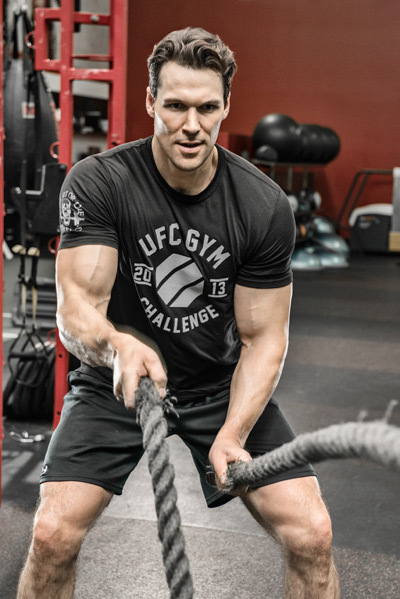 For X-Men: Days of Future Past, Prouse put Cudmore through a punishing gauntlet of two-­a­-days that maximized strength and explosiveness while also keeping him lean and athletic. Days in the gym with Prouse would normally call for a handful of proven, multijoint exercises, usually done in circuit fashion to maximize the metabolic demand. 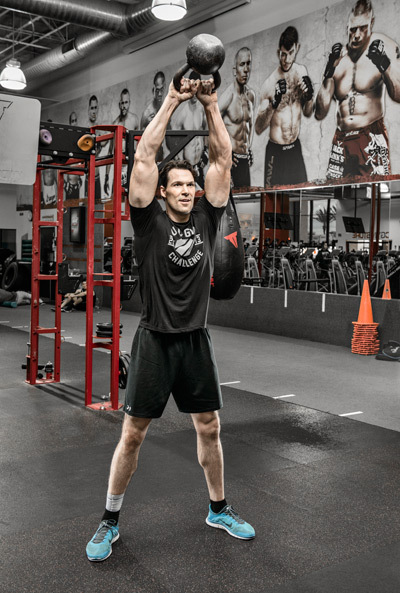 For our cameras, Cudmore enthusiastically explored the gym space, running himself through long, if somewhat staggered, sets of tire flips, pullups, kettlebell swings, and dips, with nary a sign of fatigue by the end of the half-­day shoot. Between shots, he performed sets of box jumps onto a 36-­inch platform and thundered away on hanging heavy bags. But it is precisely this relentless dedication—this frenetic and ceaseless evaluation of his physical capabilities—that has positioned him to be one of the most highly sought-after big men in Hollywood today. Looking for a Marvel-worthy physique? Maybe you should integrate a bit of Mr. Fantastic (yoga!) into your routine. Cudmore has endured a laundry list of injuries that includes a ruptured Achilles tendon, a broken ankle, toes smashed by weight plates, blown disks, a torn ACL, and a shredded meniscus—none of which, he says, were properly rehabbed. But because his career is taking flight and because he also moonlights as a stunt actor, Cudmore now takes injury prevention very seriously. Recently, he took to yoga twice a week to aid in recovery between intense training sessions. Yoga has been particularly beneficial for helping him gain increased range of motion on his squat.